Kindness Boomerang. Loved the name and the video! What you give comes back to you and this video shows it best. An act of kindness that passes from one person to another and boomerangs back to the person who set it into motion. The video by life vest inside is of course staged but it brings home a beautiful notion that what you give comes back to you! The more kindness we give out, the more it will spread and the more will come back to us! 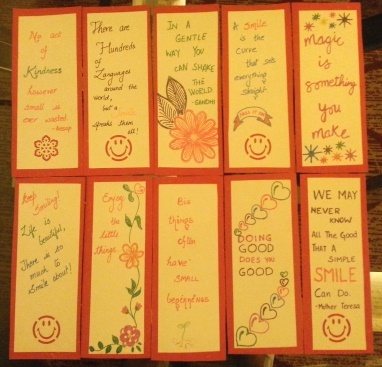 Today we left some handmade bookmarks for strangers to find. There were a lot of smiles while making them and while deciding places to leave them at! 🙂 We hope there are a lot of smiles when you find them! Share any random act of kindness you did that still makes you smile when you think about it! How about repeating it today? or try something new? Lets send the boomerang in motion! gratiTUBE is a series of short videos – a video that inspired us; a video that brought a smile to our face; a video that filled our heart with warmth and a video that we want to share and multiply the effect it had on us! If you have come across a video that you would like featured here, tell us about it!